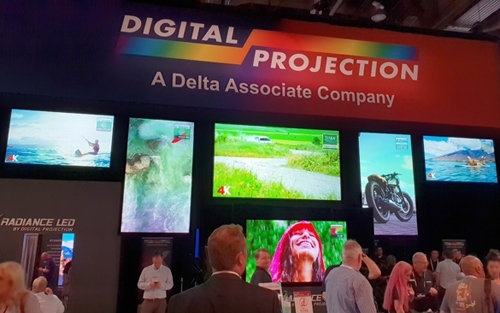 Analog Way partnered with Digital Projection, Inc. (DPI) to showcase DPI’s new INSIGHT LASER 8K projector at InfoComm 2018. Analog Way’s Picturall media servers, VIO 4K multi-format converters and Ascender 48-4K-PL multi-screen processor played key roles in the DPI booth. In April, DPI successfully deployed a similar roster of Analog Way gear in the company’s booth at NAB, DPI’s first NAB show in 15 years. The INSIGHT LASER 8K projector was the centerpiece of DPI’s InfoComm exhibit. The flagship projector, the latest in the INSIGHT product line, occupies an elite class all its own. It provides an ultra-high resolution of 7680 x 4320 pixels through 25,000 lumens of solid-state laser-phosphor illumination. Its 33 million pixel 8K resolution is the equivalent of four 4K images or 16 HD images. According to Analog Way’s Chief Technologist Andrzej Lubaszka, “every screen in DPI’s InfoComm booth was powered by Analog Way equipment. Once again we supported the INSIGHT LASER 8K projector showcasing use cases and a wide range of application examples.” In addition, Analog Way “provided playback and processing for five projectors in the air, an LED screen on the ground playing back a coordinated show, as well as an LED demonstration area featuring some 3D content,” says Lubaszka. In the booth’s marquis exhibit, Analog Way’s Picturall media server fed and managed content for the INSIGHT LASER 8K projector. VIO 4K converted Display Port to SDI as well as switched between Picturall and other 8K sources. Additionally, the booth’s LED presentation area utilized Analog Way’s VIO 4K for a 120hz 3D presentation and an Ascender 48-4K-PL for multi-window applications. The rest of the booth, featuring three 4K projectors, two portrait-mode 1080p projectors and an LED display, was powered by Picturall media servers.